I’ve always been partial to overly dark comic book-to-film adaptations. Batman and The Crow in particular spring to mind as excellent examples of somber films that owe their origins to almost Shakespearean-style tragedies and themes. In the studied hands of Ang Lee, The Hulk showed a great deal of promise and seemed to have every likelihood of following in the powerful footsteps of some very worthy predecessors. Unfortunately, everything just went very, very wrong. While I admit that I know very little about the actual Marvel Comic/Stan Lee franchise relating to the big green dude, every decision made in the movie was just…bad. First, and perhaps most grievous, is the casting of Eric Bana as Bruce Krensler/Banner. While I haven’t seen his critically acclaimed performance in the indie flick Chopper, the Aussie actor hasn’t made any kind of impression on me in his breakout films. The first of these was Black Hawk Down, where he didn’t stand out from the crowd at all, and now in The Hulk, I don’t find him sympathetic, likable, or compelling in the film’s most crucial, non-CGI role. Also, his hair is really, really awful. I get that he’s supposed to be a nerdy scientist, but come on, people. In order for a movie like this one to work, the viewer really does have to feel some empathy and compassion for the tortured lead character. Bana simply falls flat in every sense imaginable. Of course, a big part of the problem might be that he didn’t have much to work with in regards to screenplay. Again, I might have been more drawn to the story if I had more than a passing familiarity with the characters, but in this case, I was just bored. For the first hour of the film, literally nothing happens. It was so deadly dull that I’m having trouble recollecting much of the film’s plot up to that point. After the initial nap-time that encompasses the first portion of the film, things sort of pick up, though it’s not necessarily in a good way. What we get is a big, crappy CGI mess of a character who looks so ridiculous that the only natural reaction evoked is laughter. The Hulk fights some mutated dogs that look even more ridiculous than he does, then proceeds to smash through a laboratory and various army units. The most ridiculous aspect of the CGI Hulk is probably the fact that he actually uses wuxia, the “flying movement” technique that was also prevalent (and appropriately used) in director Lee’s previous film, Crouching Tiger, Hidden Dragon. It was totally out of place and completely took me out of the film (not that I was into it much) whenever he started hopping across the landscape. Though Banner and his alter ego are really the only reason to see the film, things do manage to get worse, as none of the other peripheral characters adds anything of value. The biggest co-star, of course, is recent Academy Award-winner Jennifer Connelly, who is wasted in her role as Banner’s off-again/on-again girlfriend Betty Ross. She cries a lot and looks stricken when bad things happen, but who cares? We aren’t given enough back story to care about her relationship with the big green guy, and frankly, her actions in the film are somewhat incongruent with what one might expect. Part of that dissonance is because Bruce/Betty’s history is strangely tied together due to the bad blood that exists between their fathers. David Banner is nothing more than a mad scientist with a God complex, while General Ross is a by-the-book military man with a short supply of patience. The role of the elder Banner is taken on by a Hawaiian shirt-less Nick Nolte, though I’m pretty sure he filmed his scenes after the big party that occurred before his arrest. He’s loud, boisterous, and obnoxious, with every single one of his scenes being so ludicrously over-the-top that I found myself pining for the big Hulk wuxia instead. Sam Elliott is an actor who I usually like a great deal, but his General Ross is just as much a caricature as Nolte’s Banner. In fact, he reminded me a great deal of Morgan Freeman’s Colonel Curtis from this year’s Dreamcatcher, an army guy who will stop at nothing to stop what he feels is an impending assault of doom, whether or not he truly comprehends what is happening beneath the surface. The film drags to a dead halt whenever either one of the two “old guys” is onscreen, and considering that the movie is painfully slow to begin with, that’s saying a lot. But their characters aren’t even the worst. That honor goes instead to Josh Lucas’ Talbot, who is as absurd a “villain” as you’re ever going to see (The Hulk has no real villains but he passes for a sort of bad guy). Apparently, Talbot is some sort of businessman who has past ties to Betty, and he wants to steal her work (and Banner’s) to make a barrel full of money. When Bruce gets in his way, Talbot decides to use muscle to get what he wants. Obviously, this idea isn’t the best one in cinematic history, but the character gets even more silly when his company takes over the experiments on the green genetic freak. Lucas is starting to paint himself into a bit of a corner with these insidious bit roles (he’s also played low-life miscreants in The Deep End and You Can Count on Me) and unfortunately, after The Hulk, I don’t know that he should expect much better. Considering the poor script and lack of interesting characters, it was going to be very difficult for director Lee to perform his visual magic. 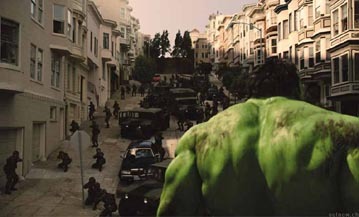 There are traces of it present throughout the film, with his use of comic book-style framing in particular reminding the audience that The Hulk is based in a medium that relies on art to convey a message. During much of the movie, the scenery has a distinct green aura about it, which is a nice, subtle evocation of the overall tone. That tone should be strongly emphasized with an effective musical score; however, the usually solid Danny Elfman’s effort is surprisingly sub-par. The soundtrack is not memorable, is too overblown, and at times seems to be trying much too hard to mimic music from other films, especially when it seems to be aiming for that previously mentioned Crouching Tiger, Hidden Dragon-style theme. While I’m not quite ready to pronounce The Hulk to be the worst film of 2003 just yet (I have seen 2 Fast 2 Furious, after all), it’s certainly right there at the bottom of the heap. Simply put, the film is an epic disappointment and an enormous waste of talent.